Easter is next week, people! Next. Week. Are you panicking yet?? Have no fear! I am here to help you get your food preparations in order, specifically those foods on the sweet end of the spectrum. I have curated a list of some of the more delectable treats that are perfect for Easter, as well as your other Springtime events (Mother’s Day, etc). You’ll find the list broken up into four categories: Easter-themed Treats, Carrot Cake Treats, Fruity Desserts, and Gorgeous Spring Cakes. Check out the list below! Which ones are your favorite?! One-hour Carrot Cake Cinnamon Rolls – Kleinworth & Co. I want one of everything. It all looks so good! Great roundup! MMMM the carrot cake sandwiches and the the cherry hand pies. yum. This is an awesome roundup! 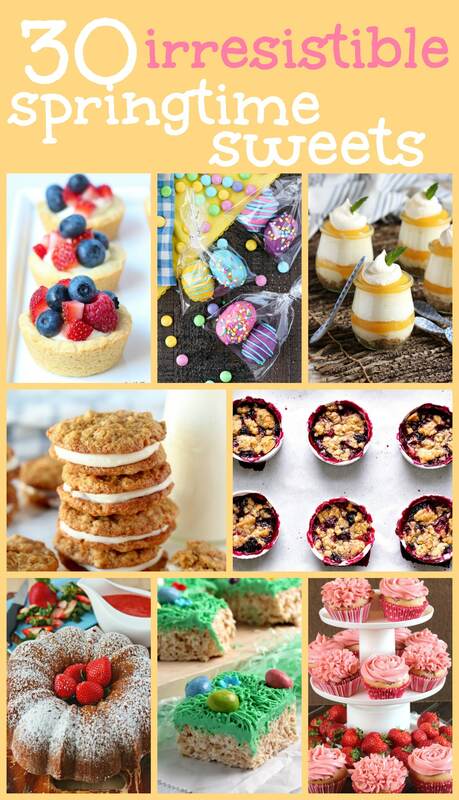 All of the desserts look fabulous and perfect for Easter. What a fun, and inspiring list! I am super hungry now! mhmm looks & sounds delicious! IDK which to make?! I’m pinning for later! Thanks for sharing! Me too! I love the carrot decor. This all looks so amazing! It’s making me sooooo hungry!! If I hadn’t just made cookies, I’d totally make some! Adding it to my recipe book! These look so good and perfect for spring! I want all of these right now!! Haha my boys and I are going to try a few for sure! All of these look absolutely amazing! I think the very first one would be my favorite, though. Can’t go wrong with cookie dough or M&Ms! Thanks for curating this collection of yummy-looking treats! I don’t know which one looks the best. Pinning for future reference. You had me at carrot cake cinnamon rolls- holy moly! These are some great desserts! I will have to make some for my next family get together! Thanks for doing the roundup!! There are so many fabulous ideas in this roundup. Springtime is the best. Thanks for sharing all these links! These all look amazing!! Those carrot cake sandwich cookies are calling my name! You’re welcome! That cake is too stunning to leave off this list!